Beginning, March 8, 2015, you can enjoy a fun-filled character dinner at Tusker House Restaurant located in Disney’s Animal Kingdom® Theme Park at Walt Disney World® Resort. 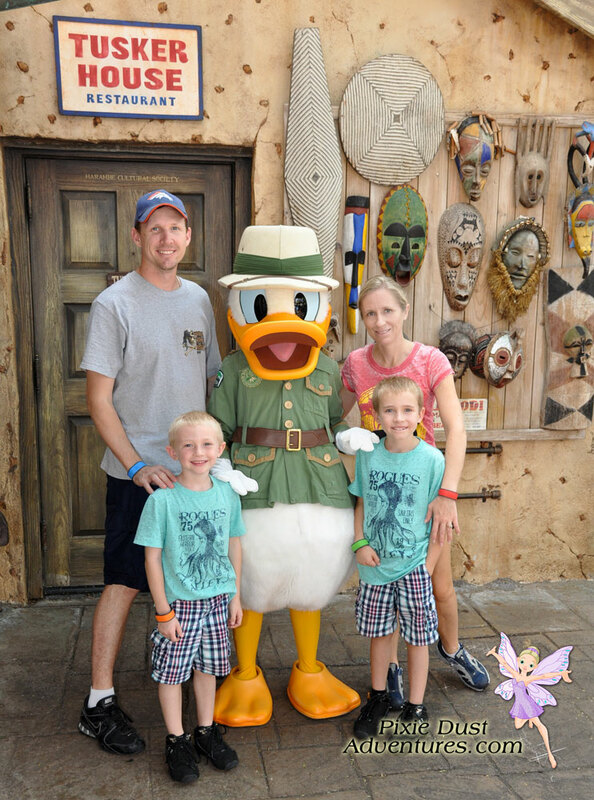 Our family photo with Donald just before entering Tusker House Restaurant. Donald’s Safari Dinner will offer you the opportunity to meet some of your favorite characters, including Donald and Daisy Duck, while enjoying a delicious selection of an all-you-care-to-enjoy dinner buffet with flavorful African influences. Guests can feast on spit-roasted carved meats, unique salads, creative vegetarian offerings, hearty stews, delicious desserts and more! In addition to this new character dinner, Tusker House Restaurant will continue to feature characters at breakfast and lunch. Donald’s Safari Dinner will be offered beginning at 4 p.m. daily. I highly recommend reservations be made 180 days prior to your visit. *Please note character appearances are subject to change. Tip: If you want to keep your photopass photo with Donald Duck, along with many other photopass photos throughout the Disney theme parks, purchase Disney’s Memory Maker package, at least one week prior to the start of your vacation, for a discounted rate. If you have booked your trip through me I am happy to assist you with getting dining reservation. I have personally visited Donald’s Dining Safari and as your travel planner, I can assist you with your reservations at no additional cost to you. It’s all part of the service that I offer to my clients. An independent travel agent with Main Street Adventures Travel Agency.